Swordfish – Food or a Magnificent Creature? Seeing that today is Earth Day, I decided to share with you a story that, I hope, will make you stop and think. We often take for granted everything handed to us by Mother Nature that we rarely actually think about what we are eating. I hope this story will stick with you as it did with me. Several days ago I had a chance to sail the Central Adriatic with a young couple from Norway. I was very keen to sail out after certain period of ‘sailing inactivity’ caused by winter and I was happy to have a chance to spend some time in Dalmatia before top tourist season. The advantage of sailing at the beginning of April is fair weather and endless calmness of island villages, but at the same time, this calmness turns into disadvantage. Most of island villages seem to be abandoned since only few people could be met on the waterfront, restaurants and bars are mostly closed and there is not much life going on. However, those few bar and restaurant owners are extra cheerful and welcoming in this period of year so something unexpected and unusual could happen. That was the case when I moored our Bavaria 44 at ACI marina Milna at the island Brač. I went to the first restaurant next to the marina in order to check out what is going on there. The restaurant was not officially open because the staff was busy with preparation works on infrastructure after winter break. Cheerful owner didn’t want to lose the opportunity to welcome his first guests so he offered something really unexpected – freshly caught swordfish! When he saw disbelief in my eyes he showed me the way to giant refrigerator where magnificent swordfish weighing 54 kg was waiting its destiny. I rushed back to our yacht and explained to my guests the offer and we all agreed about the dinner for that night. Swordfish steaks grilled on fresh pinewood were amazing and absolutely nothing to be compared with. The price also was nothing to be compared with but we also agreed that it is an unusual offer and a once-in-a-lifetime experience. Few days after I said goodbye to my new Norwegian friends that swordfish came into my mind again. My doubts were about how correct is it to eat swordfish which I thought is pretty rare in the Adriatic. I made a little poll among friends who are more into fishing and regulations and they explained to me that it was OK to have swordfish steaks for dinner. 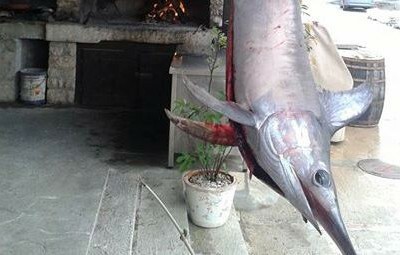 Swordfish and tuna are among the most valued trophies at big game fishing competitions at the Adriatic, but still, the catch is mostly brought back to the sea on such competitions. My friends convinced me that my conscience can be clear because I did not kill that magnificent animal and if I did not take that dinner, someone else would. OK, I can live with those facts but would certainly think twice next time when someone enthusiastically offers me something unusual.